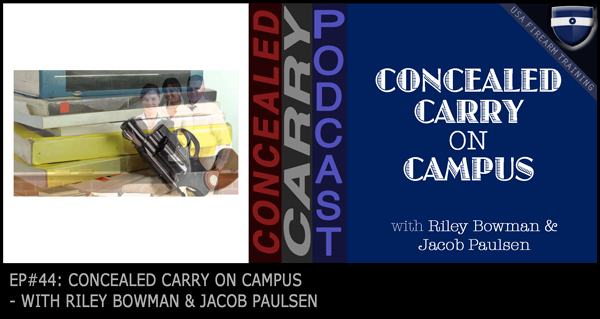 Topic: A conversation discussing the politics, laws, and best practices of concealed firearms on college campuses. Students, professors, and deans and protesting and and quitting at Texas Universities. The drama isn't warranted and this is what you need to know. Today’s episode is sponsored by the NcStar Small Mono Strap Tactical Backpack. An extremely good value as a tactical backpack this product makes it easy to conceal and carry anything else your heart desires. Currently less than $40 on our website. Click here to learn more. The discussion about off-body backpack carry reminds me why you guys like a dedicated range bag. I personally know a man that had campus carry in Idaho, but forgot he had it in his bag until the airport found it. He spent some time on a temporary no-fly list. Yeah I seem to hear stories like that all to often. Its easy to think about and see how one could easily make that mistake! I have two sons in two different universities in the Midwest. I asked them about active shooter scenario and how such a situation would play out at their respective classrooms and they need to think about this. One son said they (professor and students) actually talked about it in class and the students said it would not be good for the bad guy…the professor did not bring it up again or ask for elaboration. You hear students and teachers saying they would be afraid of a licensed carrier. It would make them unable to have open discussions. Question, do you fear those people when they are not, as far as you know, unarmed? If you don’t think someone is going to hit you during a discussion then why would they be dangerous if thy had a legal firearm? Is the weapon a mind altering device? Does that gun lower your inhibitions? Does it cloud your judgement? If it could do that then the safe people like police and military would be the most affected and the most dangerous. Of course a phobia needs no facts. Reason does not cure a phobia, it is an irrational fear. They don’t ground planes because some people fear flying. Nor is any other phobia used to limit rational people. Safe, responsible, trained carriers should carry everywhere they can. Give the maniacs something to worry about. Stop mass killings! Use common sense gun control, shoot the bad guy.